"Freedomland U.S.A." was a Disney-like entertainment park in New York. 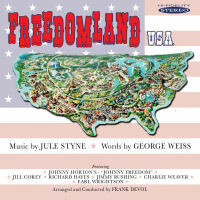 To celebrate it's opening in June 1960, composers Jule Styne and George Weiss were commissioned to produce a souvenir album consisting of songs appropriate to the various park theme areas performed by Johnny Horton, Jimmy Rushing, Jill Corey, Richard Hayes, Charlie Weaver and Earl Wrightson. First time on CD, re-mastered in Stereo and combined with rare bonus tracks performed by stars such as Ethel Merman, Peter Lawford and Jule Styne himself.